We provide professional and personalized care you need. A nightguard is a plastic custom made appliance that is worn over the teeth, similar to a retainer, to protect the teeth from any grinding or clenching that may be happening in your sleep. When you sleep, the nerves responsible for controlling the amount of pressure you put on your teeth when you close your jaws are inactive, so you can potentially put up to 10 times more pressure on your teeth and jaw joints (TMJ) without even realizing it! A nightguard is an easy fix for many problems caused by grinding and clenching and we can create a custom device for you. 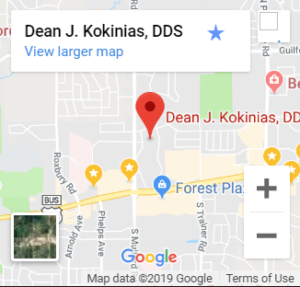 Dr. Dean J. Kokinias has been trained in one of the frontline treatments for patients with mild to moderate Obstructive Sleep Apnea (OSA) and snoring. We will custom fit you with a small plastic device that fits in the mouth during sleep like a sports mouth guard. These oral appliances help prevent the collapse of the tongue and soft tissues in the back of the throat by positioning the lower jaw forward. The airway is kept open during sleep, thus promoting adequate air intake. For a beautiful smile from professionals you can trust, contact us today.